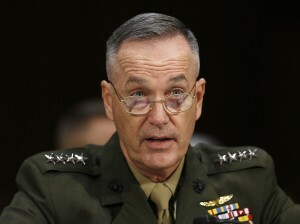 WASHINGTON (AP) — President Barack Obama nominated Marine Commandant Gen. Joseph Dunford on Tuesday to be chairman of the Joint Chiefs of Staff, the top U.S. military position, replacing Army Gen. Martin Dempsey. He’s Irish Catholic, the same as the current chairman, Gen. Martin Dempsey. He attended St. Michael’s College in Colchester, Vt., Georgetown University, and the Fletcher School of Law and Diplomacy at Tufts University in Massachusetts. He earned the nickname “Fighting Joe” when he led the 5th Marine Regiment during the 2003 invasion of Iraq, and is known as a relentless, energetic commander. His staff members sometimes carry a voice recorder with them to keep up with his commands and ideas. His selection as the nominee for chairman was hailed on the Marine Corps’ Facebook page with the customary Marine salute: “Ooh-Rah, Sir!” But Dunford’s own Twitter account had no mention of the announcement, in keeping with his usual self-effacing, soft-spoken nature. Known for his compassion with troops, Dunford often sent handwritten condolence letters to families of the fallen. But he also would talk at length about the toll the Afghanistan war was having on the local forces, and while serving in Kabul he would attend weekly services honoring the Afghans who were killed in the fight.